To Top > H-II Transfer Vehicle KOUNOTORI (HTV) > > HTV4 > News > The Exposed Pallet (EP) of the HTV4 was reinstalled into KOUNOTORI's Unpressurized Logistics Carrier (ULC). 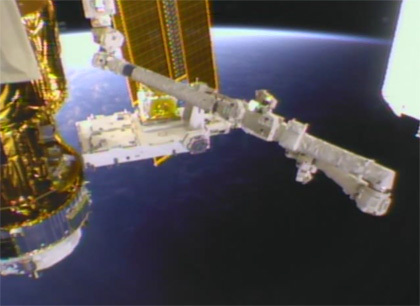 The Exposed Pallet (EP) of the HTV4 was reinstalled into KOUNOTORI's Unpressurized Logistics Carrier (ULC). After removed from the EF by the JEM Remote Manipulator System (JEMRMS), the EP was handed off to the station's robotic arm (Space Station Remote Manipulator System: SSRMS). Then, the EP was stowed into KOUNOTORI's ULC at 11:35 p.m. on August 30. The US payload Space Test Program - Houston 3 (STP-H3), which is no longer necessary is mounted on the EP. It will be disposed with the HTV4's fiery reentry. KOUNOTORI4's unberthing operations will begin on September 4 and leave the ISS on September 5.